At Leafy Couture we’re always learning to make sure that our floristry is always always innovative, that we’re always teaching our Floristry School students the most up-to-date techniques and so that we can create the installations and the day that our brides ask for. 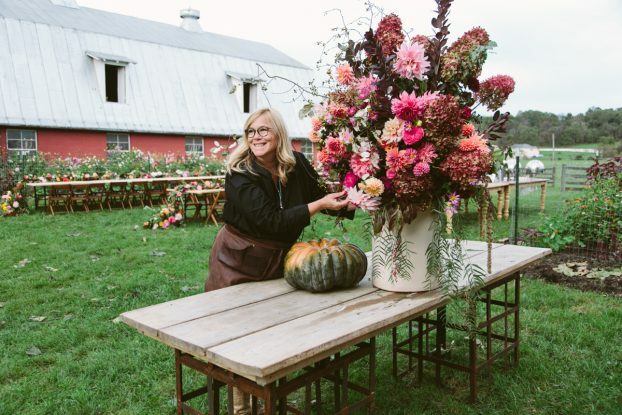 It’s no secret that the US are ahead of the UK in terms of trends and products, so last month my wonderful friend, floral designer and former Introduction to Floristry student, Lizzie of In-a-gadda-da-Vida, and I were delighted to travel to Waterford, Virginia to attend Hope Flower Farm’s annual Flowerstock. Flowerstock is a festival of workshops where, over two days, we had demonstrations, classes and talks from some of the best florists in the world. We learnt from a whole host of passionate, talented experts, including: Holly Chapple, owner of Hope Flower Farm, Holly Chapple Flowers and founder of Chapel Designers; Margaret Lloyd of Margaret Joan Florals; Steve Moore of Sinclair & Moore; and Nancy Teasley of Oak & The Owl. Steve Moore, co-founder of Sinclair & Moore, gave a brilliant demonstration on his signature floristry style. Among the tips and tricks that he shared was this cracker: whenever you’re working on an arrangement that requires you to arrange on a table, raise it up using a bucket or a box. This will mean that the beautiful tablecentre arrangement you’re working on will be viewed by you in the same way as the guests will see it. Both when they arrive at the table and, crucially, when sitting down. This gives you a different vantage point to add lots of flower-y details to and it means less bending down, great for the back of a meticulous florist who’s been up since 6am in a cold shed! Holly Chapple’s demonstration and talk saw her using two genius products of her own invention: the ‘egg’ and the ‘pillow’! These brilliant design accessories are perfect alternatives to chicken wire if you want to do a foam-free arrangement like a free form bridal bouquet or urn arrangement. These handy little tools mean you can rearrange and move arrangements without worrying about ruining your foam base, they’re sturdier and prettier than the traditional chicken wire egg, and, for those of who adore making hand tied bouquets it means we can pop the arrangement down momentarily without losing all that hard work. Better still, they’re recyclable! Making sustainable floristry easier than ever. I brought a couple home in my suitcase and I can’t wait to use them in our bridal bouquets, urns and large arrangements! One of our fellow attendees and new lifelong friend, Ozzie of Gromeza Floral Design Studio, does balloon art as well as floristry for weddings up and down the US. He taught us how to make a huge beautiful arch just like this one he designed for our evening meal! These designs are really fun and high impact. As you can see below, it’s really easy to compliment the colour scheme of your arrangement and they make a themed backdrop to the whole piece. We’re really excited for this trend to make its way over here - they really bring the wow factor. We loved going to Flowerstock because we’re passionate about creating the most beautiful weddings and events for our Yorkshire couples and producing a talented bunch of Yorkshire wedding florists and flower lovers. Roll on Flowerstock 2019! Have any of you noticed any trends coming over from America? We’d love to hear about them.